Please feel free to use or adapt this litany for your personal or public use. I ask that you attribute it. This is what we do when we don’t know what else to do. We cling to one another, voice our grief, and offer up our prayers to God. Please join in the response, Heal Us, and Reveal to Us the Abundance of Peace and Truth. We pray for the dead, remembering Martin Richard of Dorchester, Krystle Campbell of Arlington, Lingzi Lu of Shenyang, China and Boston University, and those who may die still. May the God of Life welcome them into that place where there is no pain or grief. In this hour of darkness, surround their families with a peace that passes all understanding. Gracious God, Heal us and reveal to us the abundance of peace and truth. We pray for the wounded. Bodies trained for running, hands trained clapping have been forever damaged. Our eyes have seen more than they ever should. Our ears still ring with the blast in the streets. We pray for runners who never finished the race. Attend to the wounded bodies and spirits of the survivors.Gracious God, Heal us and reveal to us the abundance of peace and truth. We pray for the EMTs, doctors, nurses and staff who tend to brokenness. Soothe those whose feet ache after hours and hours of attending to broken bodies. Bind up their unseen wounds. Make steady shaky hands, mend broken hearts and wipe away every tear. Gracious God, Heal us and reveal to us the abundance of peace and truth. We pray for the police, fire and emergency personnel who risk their own safety to preserve ours. We pray for our neighbors who serve in the National Guard. In a time of chaos and uncertainty, O God, steady those who protect us. For generations, you have been our refuge and our strength. Gracious God, Heal us and reveal to us the abundance of peace and truth. 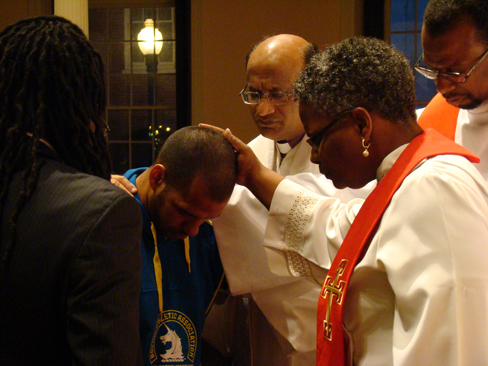 We pray for our counselors, clergy and mental health professionals. May they guide troubled minds and broken spirits. Bless those who devote themselves to the care of others. Give them strength for the long days ahead. Gracious God,Heal us and reveal to us the abundance of peace and truth. We pray for the media, our reporters and photographers. We give thanks for those who strive to share stories of suffering and hope. We remember that all who work telling stories of truth and beauty, return home to their own families. Flush their eyes. Renew their passion. Gracious God, Heal us and reveal to us the abundance of peace and truth. We pray for the students, visitors and tourists far from home. Give them comfort in a strange city. Gracious God, Heal us and reveal to us the abundance of peace and truth. We pray for those who make their homes on our streets, displaced from familiar areas of the downtown. Strengthen our resolve to work for a more just, free and secure society. Gracious God, Heal us and reveal to us the abundance of peace and truth. We pray for our children startled by such chaos in our streets. Give us wisdom to raise them up in the paths of peace. Be with our city’s parents, teachers and child care providers who try to answer the questions of anxious children. Gracious God, Heal us and reveal to us the abundance of peace and truth. We pray for the FBI, the investigators and all who guide our justice system. Help us not seek vengeance but truth and justice. Gracious God, Heal us and reveal to us the abundance of peace and truth. We pray for the perpetrators of violence. We confess the dark places in our own hearts that lust for revenge. Give us a love stronger than hate and a peace stronger than violence. May peace flow through our city like the Charles River. Gracious God, Heal us and reveal to us the abundance of peace and truth. Convict us to rise above the hatred that wrought such violence. Guide us to resist gossip and rumor. Preserve us from quick judgments. Give us wisdom in the days ahead. Reveal to us peace and truth. Gracious God, Heal us and reveal to us the abundance of peace and truth. We pray for our President Barack, our Governor Deval, our Mayor Tom, and all our elected officials. Give them gentle words and wise hearts in the days ahead. Gracious God, Heal us and reveal to us the abundance of peace and truth. Train our eyes to see acts of kindness in our city. Prod our hands to reach out to strangers. Silence our tongues when we are tempted to lash out in frustration and fear. Give us all words of comfort and love. Gracious God, Heal us and reveal to us the abundance of peace and truth. Give us the courage to endure what cannot be avoided. Bring us hope that we will be made equal with whatever lies ahead. Bind us together as a city on a hill. Knit us together as a Commonwealth. Draw near to us in this time of sorrow. Gracious God, Heal us and reveal to us the abundance of peace and truth. Even as we grieve, we will remain steadfast in charity, defiant in hope, and constant in prayer. Though the race before us this day is hard, remind us again and again, that we do not take a single step alone. Gracious God, Heal us and reveal to us the abundance of peace and truth. Let the People say, AMEN. Bless you Helen. And thank you for your support. Thank you for this litany. I would like to use it in a service. How do I attribute it? “RevEverett April 17, 2013”? Thanks, Laura. We light a peace lamp every Sunday at the start of our service. This Sunday’s peace lamp will be for Boston. Prayers from Washington, DC and surroundings! why aren’t the perpetrators of violence named? A glaring omission. What aren’t the “perpetrators of violence” named. a glaring omission and lost opportunity to be peacemaking and show God’s ways are not the ways of the world. Thank you for your watchful eye and compassionate heart. I am grateful.